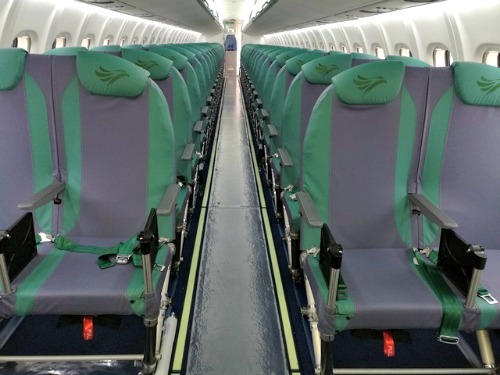 The Philippines' leading budget airline, Cebu Pacific, through its wholly owned subsidiary, Cebgo, has chosen the world's lightest aircraft seat, Expliseat, for its ATR 72-600 aircraft. The titanium seat will be installed on all 16 aircraft, two of which are already being utilized by CEB. The lighter seat is expected to help decrease fuel burn while allowing the carriage of more guests and cargo on board. "With Expliseat's ultralight seats, CEB is able to provide comfortable seating to its guests while allowing for a more fuel-efficient operation which will lead to more affordable fares. With CEB's low fare offer, we hope to further stimulate inter-island connectivity and contribute to the economies of the destinations we operate in," says Alexander Lao, President and CEO of Cebgo. "Expliseat is proud to announce its collaboration with Cebu Pacific Air. This agreement confirms the unique balance between passenger comfort, high reliability and weight savings that can be offered by the Titanium Seat," comments Benjamin Saada, Chief Executive Officer of Expliseat. The Titanium Seat is a technological breakthrough registered under 16 patents, made of ultralight materials such as titanium and carbon composite resources. Founded in March 2011, Expliseat has combined innovative material and disruptive design to provide improved aircraft efficiency solutions and passenger experience thanks to its ultra-light aircraft seat. In 2013, Expliseat launches the Titanium Seat for the A320 series. In 2015, Expliseat enlarges its product range to regional aircrafts by retrofitting the 10 ATR of Air Tahiti fleet with Titanium Seat weighted at 5.3kg per passenger. In 2016, Expliseat achieves a new technology breakout by introducing the Titanium Seat NEO designed with the Peugeot Design Lab to offer a brand new experience to passengers on short and medium haul flights. The Philippines' leading carrier, Cebu Pacific Air (PSE: CEB), through its wholly-owned subsidiary Cebgo, received its third ATR 72-600 High Capacity aircraft last Friday, February 3, 2017. This aircraft is the first ATR 72-600 delivered for this year, bringing the airline's total fleet to 58. This brand-new ATR 72-600 will be utilized for the two new routes CEB will be launching this February 15, 2017: Manila to Masbate and Manila to Tablas. "We are glad to take delivery of another brand-new ATR 72-600, especially since this is the first to have the titanium seats from Expliseat installed. This aircraft therefore combines reduced seat costs while optimizing comfort for passengers," said Alexander Lao, President and CEO of Cebgo. "Furthermore, this latest order allows us to fulfill our commitment in increasing inter-island connectivity, while offering our unbeatable low fares through this aircraft's fuel efficiency," added Lao. Along with the two new routes mentioned above, CEB will also be launching two more routes from Northern Mindanao. Starting March 15, 2017, our valued guests will be able to fly from Cagayan de Oro to Bacolod and Tagbilaran, and vice versa. Today, CEB operates one of the youngest and most modern aircraft fleets in the world with an average age of 4.92 years. This new ATR 72-600 will be used to support CEB's expansion plans in the archipelago, now servicing to 37 domestic destinations flying out of six strategically-placed hubs in Manila, Cebu, Clark, Iloilo, Kalibo and Davao. CEB also offers flights to 29 international destinations, covering an extensive network that spans Asia, Australia, the Middle East, and USA.